As an option Vapourtec offer the strong acid resistant R2C module. The Vapourtec acid resistant pump system features some specially developed components. 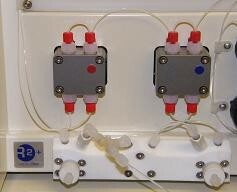 Capable of pumping at flow rates of 0.05 ml/min and pressures up to 42 bar. This can be used to pump (for example) fuming nitric acid or concentrated sulphuric acid, and has been in use in industry doing exactly that since 2009. This kind of chemical resistance applies to more than just nitrations. Butyl lithium, concentrated TFA and many other corrosive reagents can now be handled, opening up a range of hitherto inaccessible reactions. This capability has been achieved without any compromise in performance. The acid resistant system offers the same flow rate, pressure and temperature performance as the original R Series. All of the required tubing fittings and back pressure regulators to operate a fully acid resistant system are included.